Did you know that Catfish can be kept as pets? I didn't until recently when I was shopping for new fish for our aquarium. I came across a lovely Spotted Cory Catfish and fell in love. We named him Joe the Catfish. Joe is only about an inch long and he is very fun to watch swimming along the bottom of tank. June 25th is National Catfish Day. It's a National observance by the United States celebrating the value of farm-raised catfish. I think the "holiday" may not exactly be for my pet Cory Catfish, but they don't mind celebrating nonetheless. This past weekend, I picked up 3 more Cory Catfish. There are many different varieties of Cory Catfish. I purchased some Emerald Green Cory Catfish. My Neon Tetra is photo-bombing the catfish. I think Cory Catfish are my new favorite pet fish! They are just so cute! So Happy National Catfish Day to all the catfish out there. Hope you're able to find lots of delicious noms on the bottom or your tanks. And a very Happy Wordless Wednesday to our friends! The quiet pets one can have! Your tank looks fantastic! Crystal clear and I too love cory cats. Interesting, I didn't know there was a National Catfish Day, but farmed catfish are a big success story for the environment too (unlike, say, farmed salmon). Anyhow, congrats on your new pets! Thanks! I got rid of those stupid pink gravel rocks over the weekend for something that looks more natural. Next on the list is real plants and not fake ones. Woof-hoo...look at those "whiskers" he has in the past photo. You always have a surprise pet, Miss Ann. Aquariums are so relaxing and we never knew someone could keep catfish as pets. Happy WW. Oh wow lol... sounds like he wanted the whole tank to himself! They sure would be fun to watch! Supposedly, they should get about 3 inches long. We're sure glad Joe isn't one of those farm-raised, eatin' kinds of catfish! Happy National Catfish Day! I am hoping to get a small tank in my new place and become a "fish mommy". I could watch them all day! 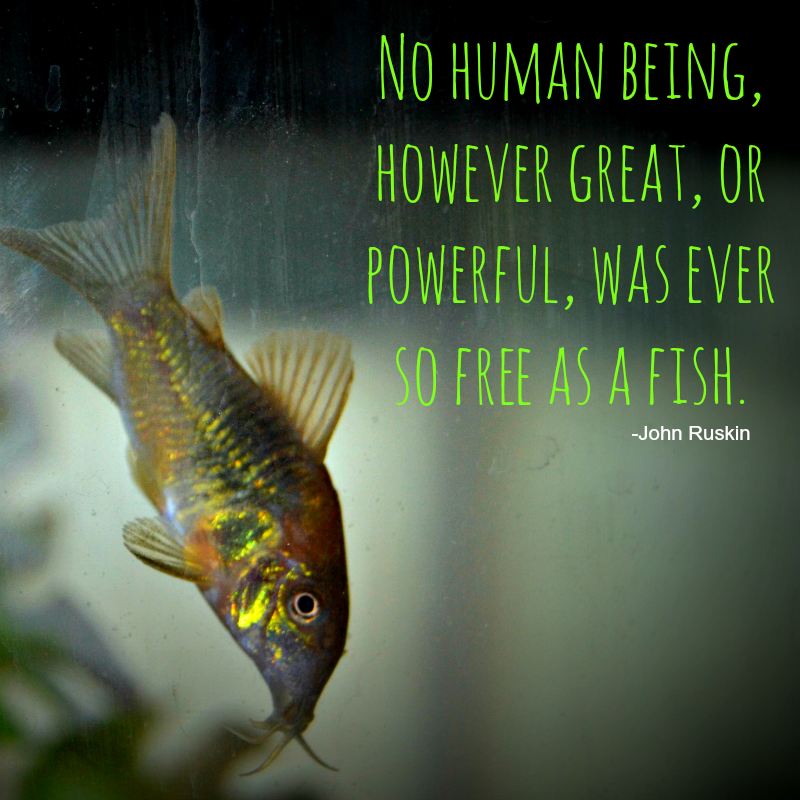 Catfish were always a "staple" fish in our aquarium as kids because they helped keep the bottom of the tank clean. Those are so beautiful. I love fishes, I sit help mummy feed ours and hope she'll share some of their food with me. Sadly she doesn't, but I keep trying! Those fishies are very tasty...er, we mean...pretty! Yeah, pretty! Very cool! We have lots of giant catfish in our area. It's great to see that they get a day too :) They do a lot of work cleaning up the bottoms of our lakes and rivers. Ah yes, we have those in the lake too! They are HUGE! How neat! I didn't know this, so interesting to have a pet catfish. Happy National Catfish Day to them! Happy Wordless Wednesday, Enjoy your new family member. Ann, you never cease to amaze me! Who (but you) would know about National Catfish Day? I love it. And yes, Joe is very striking with his spots! Well, sometimes I google strange holidays and write about ones that tickle my fancy lol! I'm a cat fish nut! 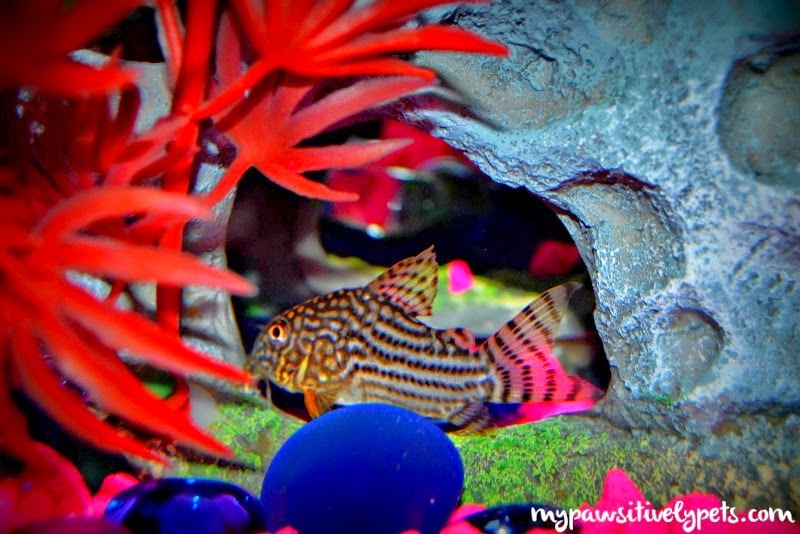 I love them and clown loaches and all the bottom dwellers! :) Right now my 38 gallon tank is empty, and the only thing I've got going is a 2.5 gallon that holds a little female Betta named Lorna Doone (after the cookie!). 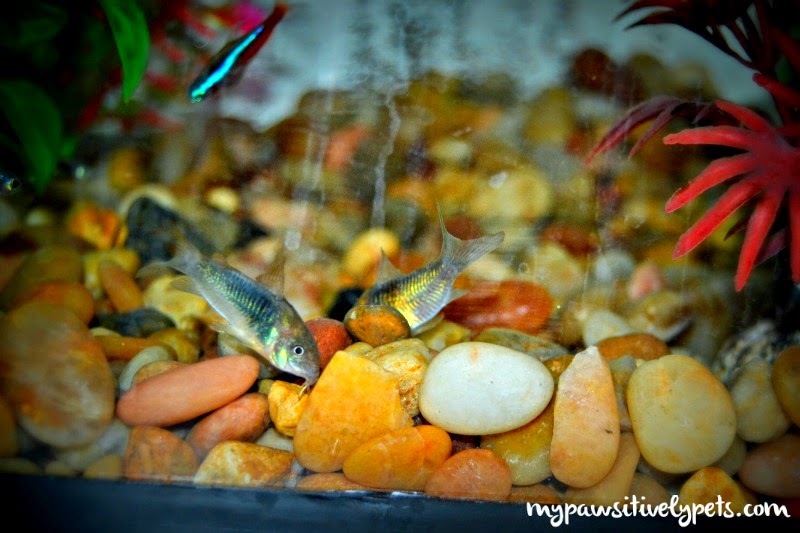 When I get my big tank set up again, you can be sure it'll have a few cat fish! Btw, your photos are amazing. That first one is incredible! What kind of camera do you use? I wish I could have a huge tank like that! Maybe one day :) Thank you, I use a Nikon D3100. I think the outside of the tank must have been cleaner when I took the first photo. You can see water spots on the other ones. I've never heard of Cory Catfish before. They are cute! Great post! I had no idea there was a day for catfish!!!! The last one I got from you was a reply saying that you saw my email. Thanks so much Ann, you've always been there for Bailey. I've been looking into getting a dumbo halfmoon betta, but I hate changing tanks! How pretty! I didn't know they had their own special day. I'm sure you enjoy him. Nice fishes you got there! Those are fun to have in a tank since they aren't nocturnals. I used to have them on my tank. They really do a good job at cleaning up after the other fishes. They really are pretty little fish! Do they stay that small, or do they get bigger? They will get bigger. They are pretty small now maybe an inch long. I read that they should get 3-4 inches. Wow, they are so lovely. But I've missed this National Catfish Day, what's a pity!